The electoral bonds scheme came into effect in January 2018. 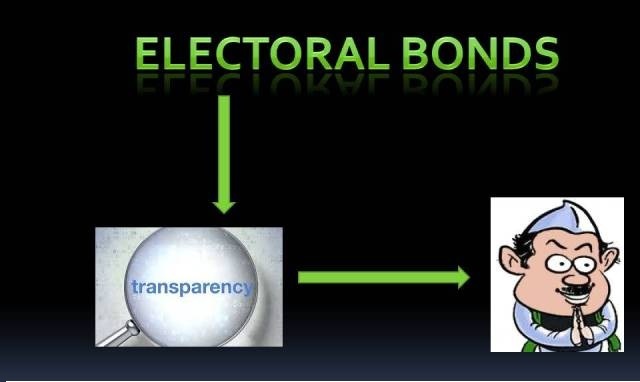 The electoral bond is a bearer bond in the nature of the promissory note. Selected branches of the State Bank of India are authorized to issue the electoral bonds purchased through a bank account. The bond is available in multiples of Rs. 1,000, Rs. 10,000, Rs. 1,00,000, Rs. 10,00,000 and Rs. 1,00,00,000. The bond would be issued at designated SBI branches during a period of ten days each in the months of January, April, July and October. The bond has a life of 15 days during which it can be donated to a registered political party which has polled 1 per cent of the vote in the state, or, national election. The party has to open a bank account in a designated SBI branch. The party does not have to disclose who it has received the bond from in its account. Neither does the donor entity have to state to which party it has donated. The system of electoral bonds will only facilitate corporate funding to the ruling party and open the way for legitimising bribery and corruption. Companies will have the incentive to provide huge contributions to the ruling party to earn its favour. Already through the Finance Bill, an amendment was made to the Company Law. The cap on companies giving funds to political parties of 7.5 per cent of the average of net profits earned in the previous three years has been removed. Further, the amendment had done away with the requirement which provides for disclosure of the name of the political party to which the company makes the contribution. So now, companies can give unlimited amounts to a party without it being made public. The Finance Minister had claimed, at the time the electoral bonds were introduced, that this will bring in more transparency and cleanse political funding. Nothing can be more hypocritical and untruthful than this claim. If transparency is the aim, the identity of the donor and that of the recipient party should be publicly known. The present government has found a way to legitimize bribery and kickbacks – by donations made through anonymous bonds. Earlier, a company which won a contract would have had to pay a bribe illegally under the table. The electoral bond scheme will make all such kickbacks legal. For instance, if a commission of 10 per cent has to be paid by a company for getting a contract worth Rs. 1,000 crore, all it has to do is to provide an electoral bond for the amount of Rs. 100 crore to the ruling party. There is no way for the public to know about such a donation, nor can any investigating agency ask questions about it. The opaque bond system can be misused for money laundering and black money operations through the use of shell companies. The other less noticed aspect of the electoral bond scheme is that it opens the way for foreign companies to fund political parties in India without it becoming public. In the Finance Bill of 2016, the government had amended the Foreign Contribution Regulation Act (FCRA) to treat contributions by Indian subsidiaries of foreign companies as funding from Indian sources. With this amendment of the FCRA, foreign corporate funding to political parties was legalised. It may be recalled that all the amendments made to the Representation of People Act, the Reserve Bank of India Act, the Income Tax Act and so on were smuggled in through the Finance Bill. Since the Finance Bill is a Money Bill, these amendments were thus put outside the purview of scrutiny and voting in the Rajya Sabha. The first issue of electoral bonds was in March this year. A total of Rs. 222 crores of bonds were issued. Of this 95 per cent of the bonds were given to the BJP worth over Rs. 210 crore. This is revealed by the BJP’s accounts submitted to the Election Commission. Further, of the total of Rs. 470.8 crore worth of bonds issued in four tranches from March to July, 99.7 per cent of the bonds purchased were in the denomination of Rs. 10 lakh and Rs. 1 crore. There were no issue of bonds in lower denomination of Rs. 10,000 or Rs. 1,000. This shows that the bonds were subscribed by corporates or rich businessmen. It confirms the fact that this is a scheme for corporate funding of the ruling party. following issues are raised by ECI itself.